WASHINGTON, DC — Millions of Americans report having experienced domestic and sexual violence. Despite the enormity of this problem, a new poll shows pastors often fail to address it appropriately and consider themselves ill-equipped to respond to incidents of violence within their communities. A survey of 1,000 Protestant pastors conducted by LifeWay Research on behalf of Sojourners and IMA World Health found that an overwhelming majority of the faith leaders surveyed (74%) underestimate the level of sexual and domestic violence experienced within their congregations. Despite its prevalence in society, two out of three (65%) pastors speak once a year or less about the issue, and when they do address the issue, they may be providing support that does more harm than good. Though this survey showed that churches are currently falling short of their potential, there was encouragement: 80% of pastors said they would take appropriate action to reduce sexual and domestic violence if they had the training and resources to do so—revealing a great opportunity to turn this uncertain and unprepared group into powerful advocates for prevention, intervention, and healing. 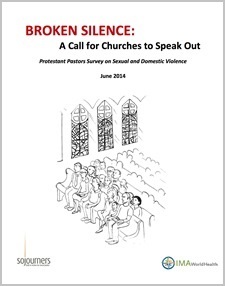 A report detailing the poll’s findings and methodology, entitled “Broken Silence: A Call for Churches to Speak Out,” is available by clicking here.